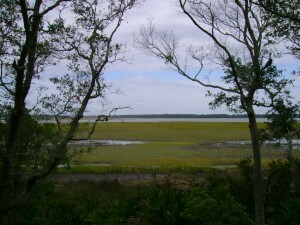 This vista over the beautiful salt marsh is just one of the surprises awaiting you at Crooked River State Park in St. Marys, Georgia. 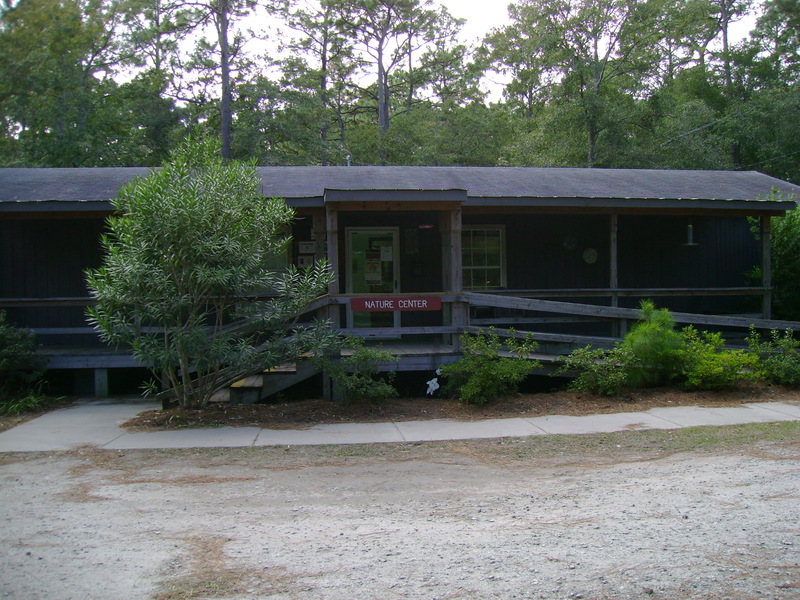 Crooked River State Park, located in St. Mary’s, Georgia, is a nature lover’s paradise and the perfect place to spend a few hours walking. 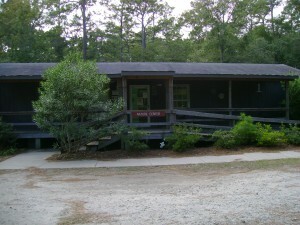 Home to a variety of diverse habitats (from salt marsh to pine barrens) and wildlife (from raccoons to bald eagles), Crooked River is a true gem of Georgia. The starting point for our half-day adventure was the Visitor’s Center. Here we paid our small parking fee and received a free map containing all the walking trails in the park. We also received a flyer listing the times of all the activities taking place in the park including the wildlife exhibitions at the Nature Center. 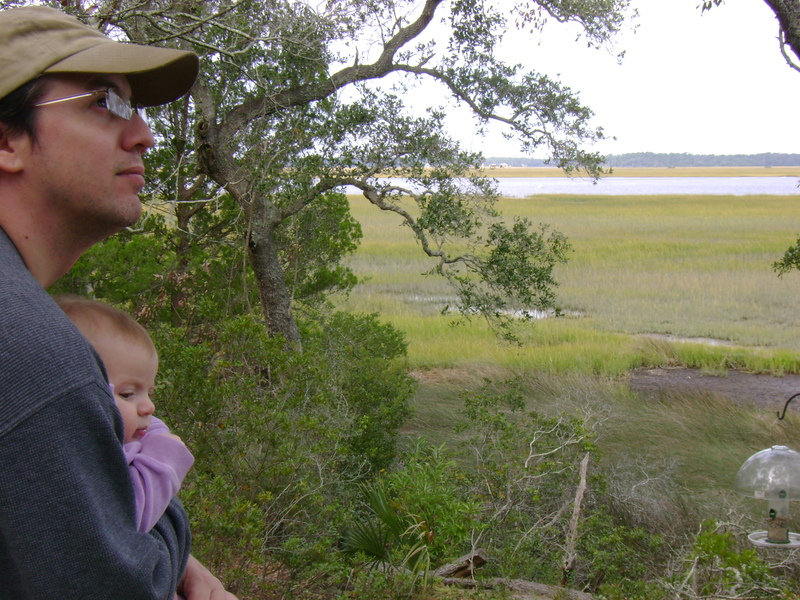 Since the first wildlife lecture wasn’t for a couple more hours, my family and I decided to hit the trails. 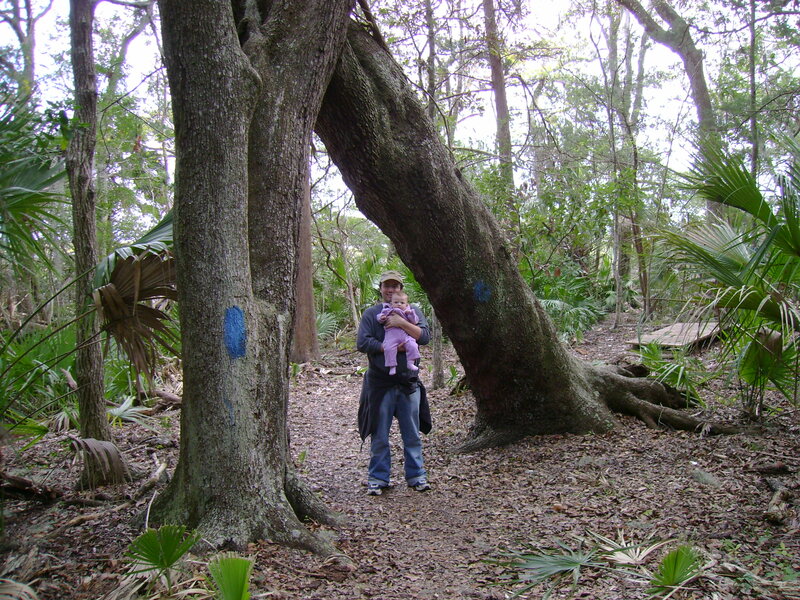 The walking trails were a short drive from the Visitor’s Center. 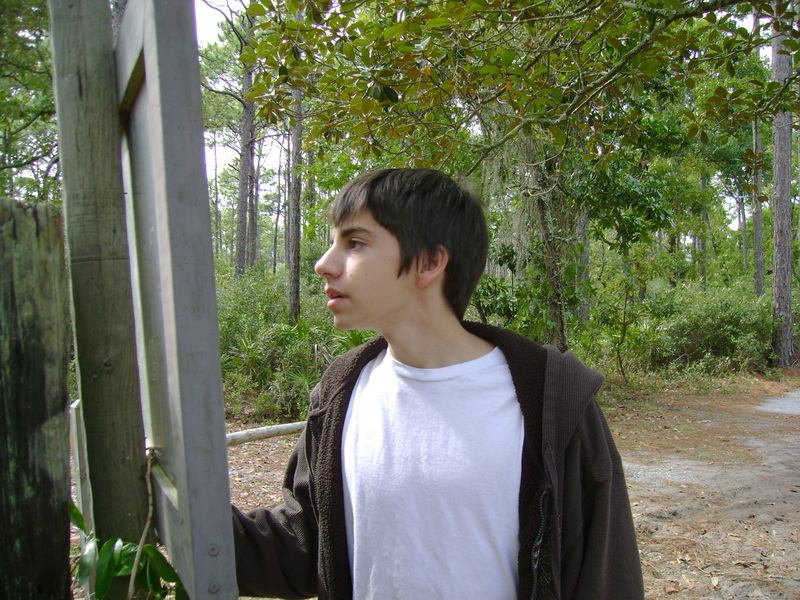 Once there we saw a large sign with a map of all the walking trails. 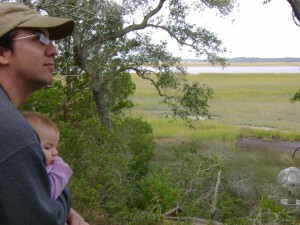 After studying the map we decided to take the trail that led to the salt marsh and an observation deck.. 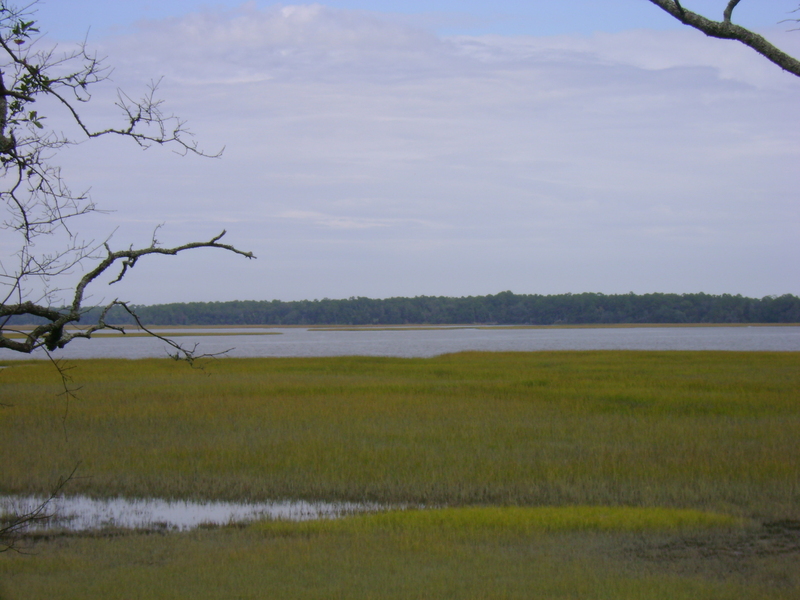 The salt marsh is a massive filtration system that cleans water runoff from the land before it enters the rivers and sea. 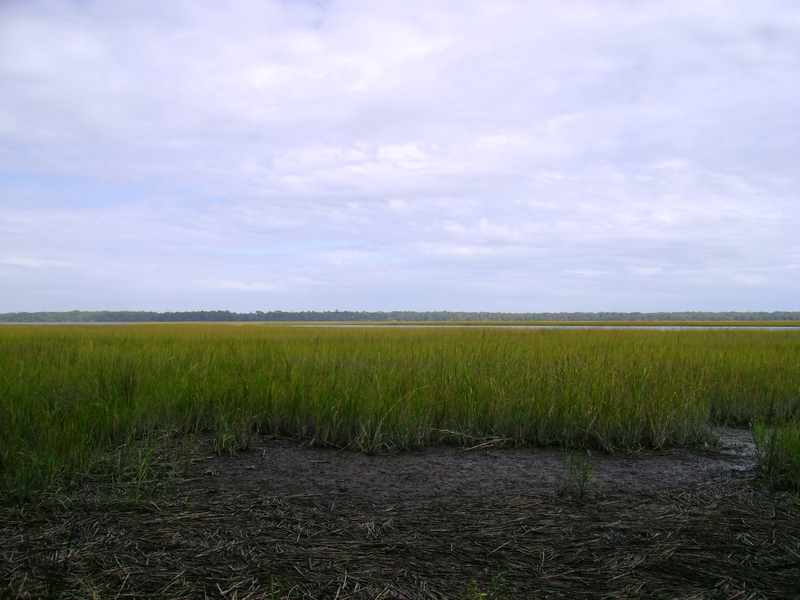 Because of this it has a very high nutrient content which makes the perfect breeding grounds. 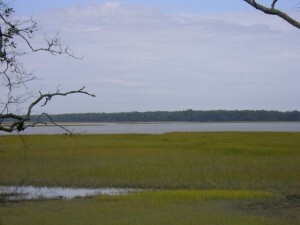 Many ocean species begin their life in these salt water estuaries including shrimp, oysters and other shellfish, blue crabs and many fish species. 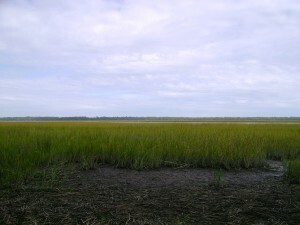 Without this coastal habitat much of the seafood industry would collapse. 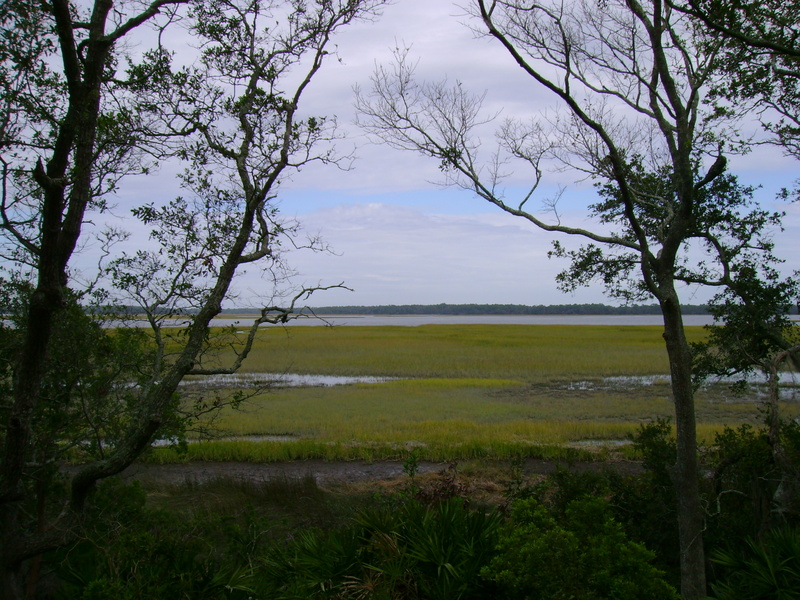 Thus these salt marshes aren’t just beautiful to behold but also provide much food and jobs for the local residents. It was hard to pull ourselves away from this beautiful location but after several more minutes gazing across the marsh and taking in the fresh salt air we decided to resume our exploration of Crooked River State Park and see what other surprises awaited us. Further down the trail we came across several downed trees. 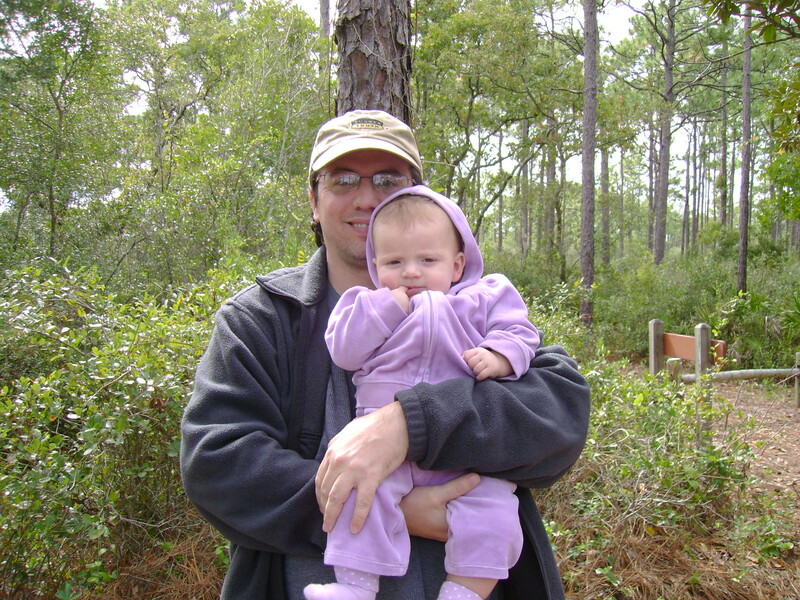 It would be hard to talk about Crooked River State Park without mentioning the great variety of trees. 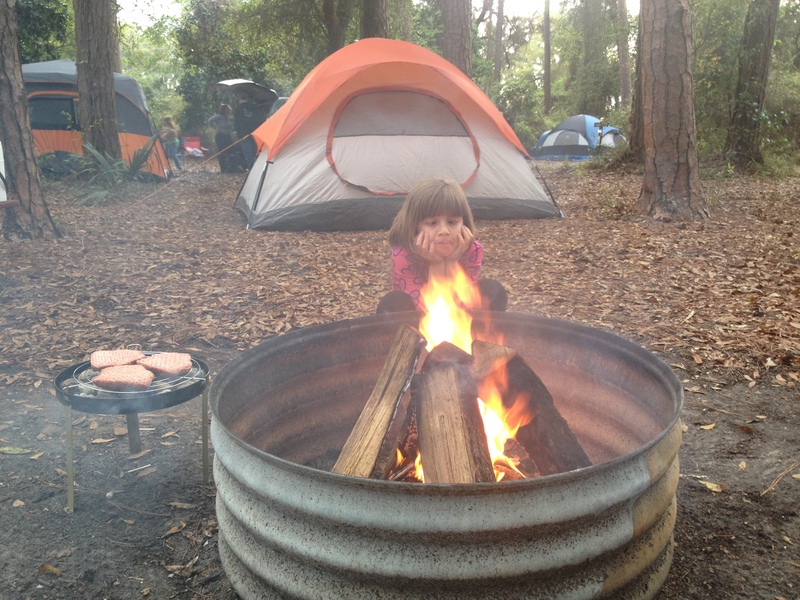 The park provides an amazing educational opportunity to see trees at every stage of their life cycle. 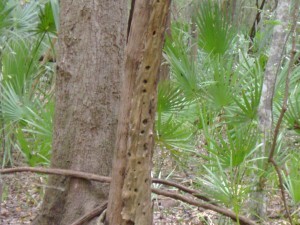 Those at the end of their life cycle provided habitat for all sorts of creatures, especially wood-eating insects like termites. 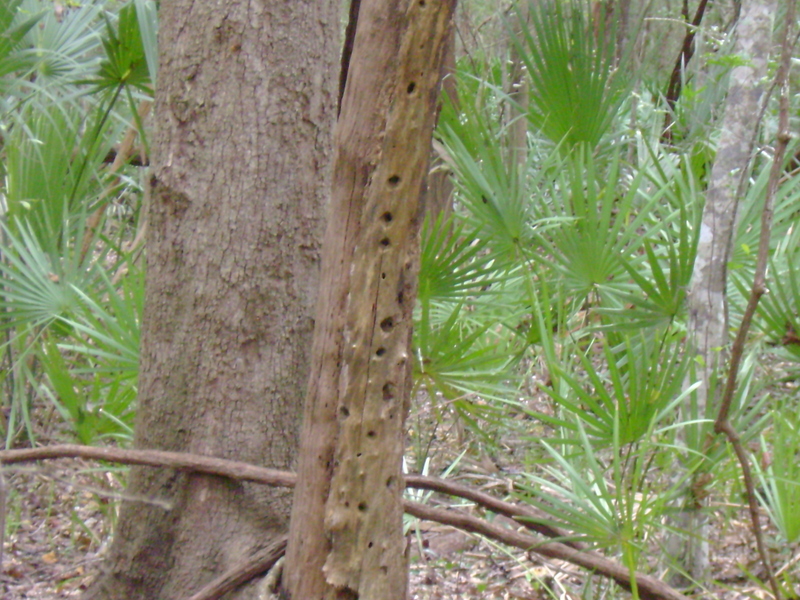 But the termites also provided food for other creatures such as woodpeckers who drill into the dead tree trunks in search of their next meal. The neat, nearly perfectly circular holes left behind turned a simple tree trunk into something approaching modern art sculpture. Another fallen tree offered another example of natural modern art. 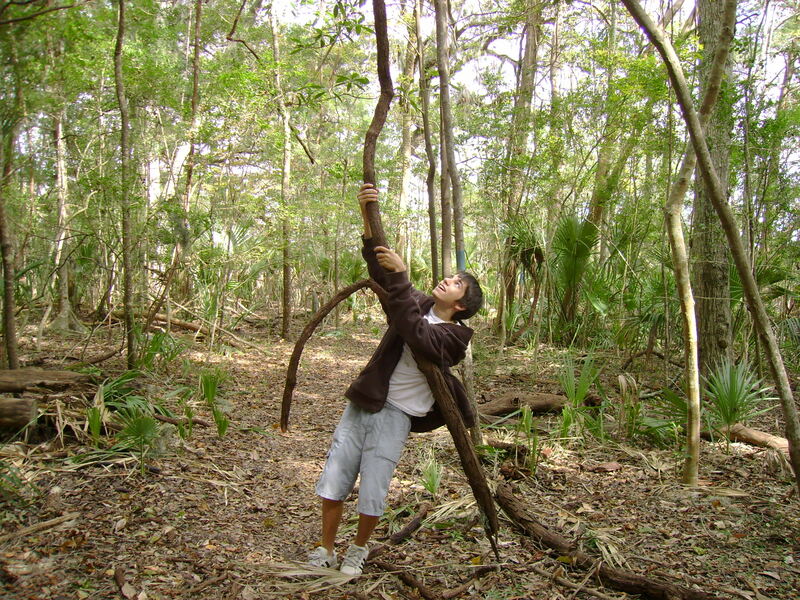 What at first appeared to be the tree’s gnarled branches turned out to be, upon further inspection, actually the tree’s root system. 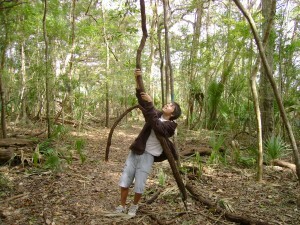 These tightly interwoven roots grew at a right angle from the tree trunk, through the air and then down into the ground. Amazingly, the tree was not dead but was thriving. It appears its struggle for survival created a unique adaptation which I’m sure amazes all the park’s visitors. 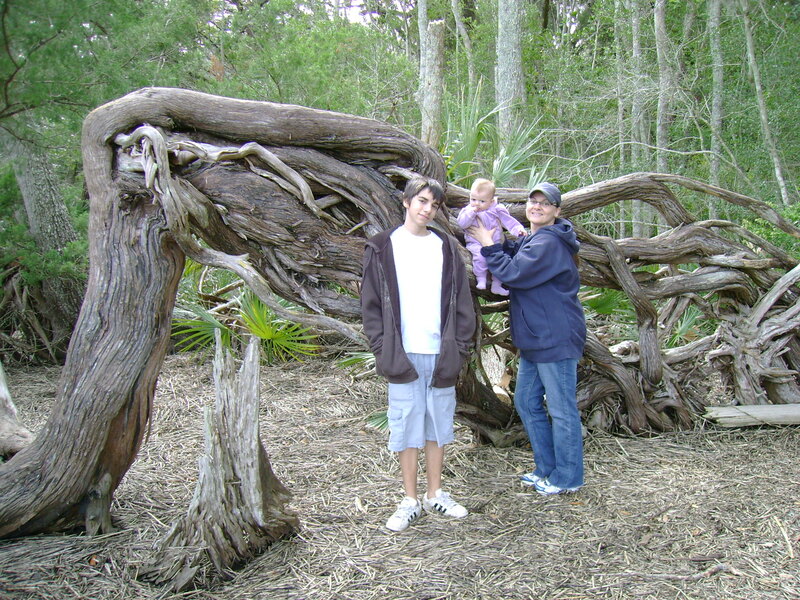 This unique tree was growing on the edge of the salt marsh which gave us the opportunity to get a closer view of this ecosystem. As we walked towards the marsh grass the ground seemed to come alive with movement. Dozens of tiny fiddler crabs scurried down into their protective holes only to rush back out once we stopped or backed up. It almost became a dance between our forward movement, followed by their backwards movement, followed by our backward movement and then their forward movement out of their holes. We soon retreated and left the fiddler crabs to their search for food and mates. Overhead I saw the distinct outline of an osprey. Then moments later I saw what at first appeared to be another large osprey but in total disbelief I realized was an American Bald Eagle. This was only the second time in my life that I’d seen a bald eagle in the wild and each time it’s like spotting a movie star or rock star. It’s quite thrilling to see something you’ve seen so often on television but so rarely in real life. Heading back down the trail brought us to another fallen tree which was stopped prematurely before it hit the ground. 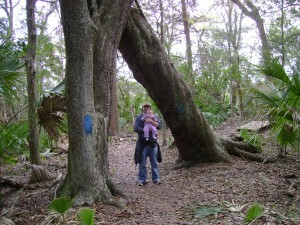 It wedged itself into the v-shaped trunk of another tree thus creating a natural archway. Like the previous tree, it somehow managed to survive and was continuing to grow skyward at a slightly slanted angle. By this point in our hike we were getting quite tired. The paths were filled with tree roots breaking through the surface making our “off-road” baby stroller useless. This required us to carry our four month old baby for most of the walk. (“Ah, had we only brought our ‘Baby Bjorn,” we thought to ourselves.) 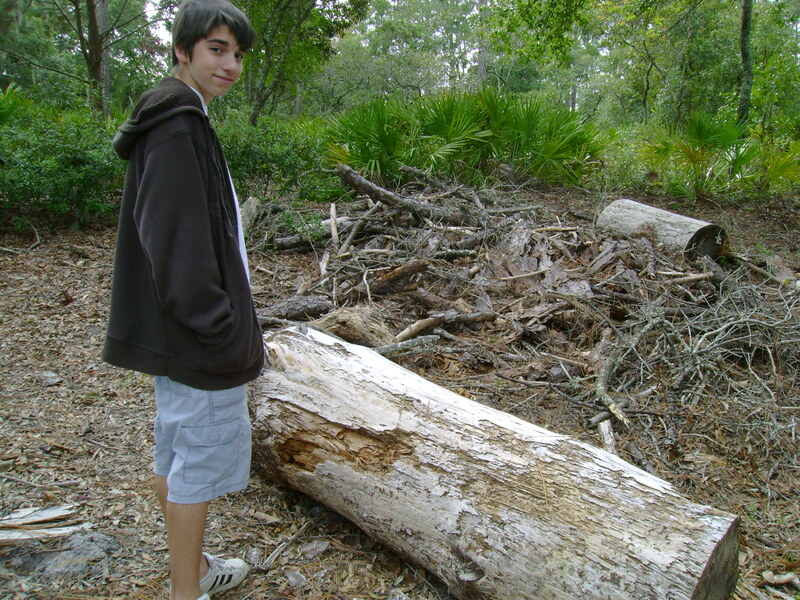 Luckily for us park benches are located at strategic locations along the trails. 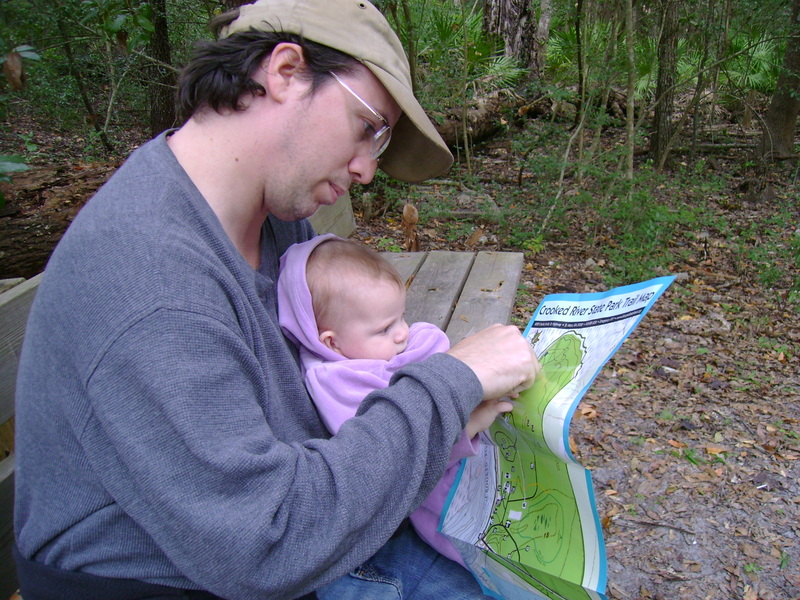 This was also an opportune time to consult my map to see where we were and what other trails there were to explore next. 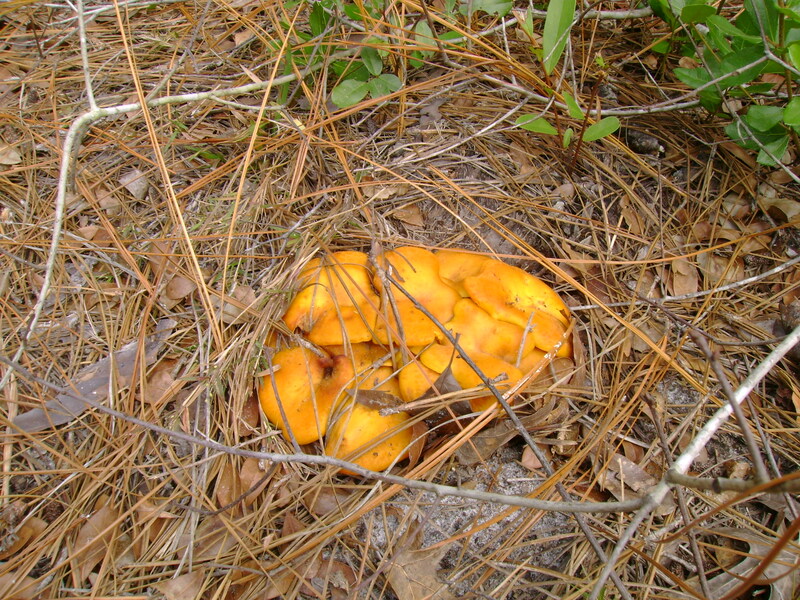 The brilliant green of the palmetto plant would soon be contrasted with the bright orange of a mushroom. Crooked River State Park is filled with such colorful contrasts. 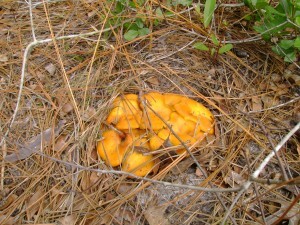 As we now entered into the long leaf pine section of the park the trail was covered with orange, dried pine needles. The needles of these pines were used by both Native Americans and modern craftsmen to create baskets of incredible beauty and utility. There was a stark difference between the hardwood forests and these pine forests. 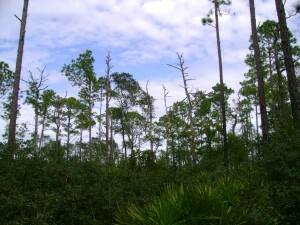 The hardwood forests created a dense canopy that virtually blocked out the sun whereas the pine forests were more open which allowed a greater abundance of plant life to thrive on the forest floor. 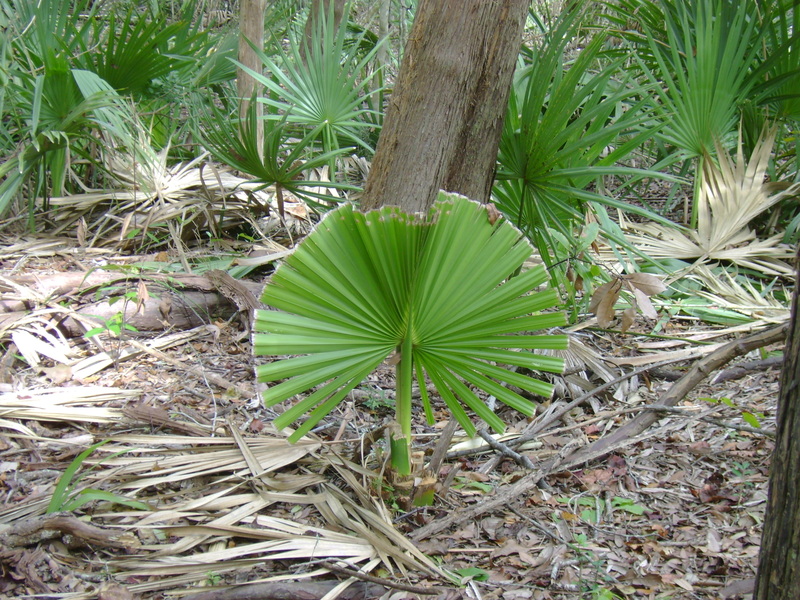 Yet mostly the forest floor was taken over by palmettos. They formed a dense, almost impenetrable thicket of spikes that one would have to navigate through carefully. The temperature change here was quite noticeable as well since more sunlight penetrated through the branches. Many of the pines appeared to be dying. 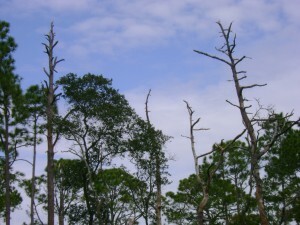 The bark had fallen off entire clusters of trees due to an infestation by a pine beetle. If I had to choose I would have to say the hardwood forests make for a much more enjoyable hike. They provide greater shade and are thus much cooler. 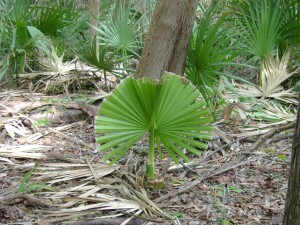 Plus there seems to be a greater variety of plant life. The pine forests seem dominated by pines and palmettos and not much else. We had reached the end of our hike and just in time too. It was a little past time for the wildlife demonstration at the park’s nature center. We arrived and noticed a lot of bees swarming outside the center. I thought this was curious but since we were already late didn’t give it much thought and headed inside. We walked in the middle of the presentation, just as the naturalist was passing around a snake for everyone to touch. Next she brought out a baby alligator for everyone to touch. Everyone got a thrill watching her try to catch the baby alligator in his aquarium. After the presentation we walked around and looked at the exhibits featuring various wildlife found in the park. Several live exhibits featured the many snakes, reptiles and amphibians that were native to the area. Plus the walls were adorned with many stuffed animals such as raccoons, bobcats and fox. 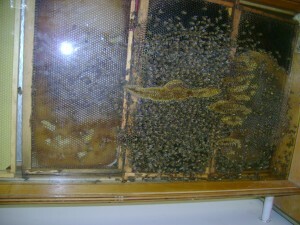 In the next room I discovered why the bees were swarming outside the building. The nature center has an active beehive on display and the bees enter the hive through a small pipe that runs from outside. It was fascinating watching the busy bees at work and made for a perfect end to an overall perfect day at Crooked River State Park. Crooked River State Park is definitely one of the most beautiful places in southeast Georgia and on a nice fall day it makes for a wonderful and relaxing outing. So whether you’re already in St. Marys or simply passing through on I-95, it’s worth your while to stop in and visit this one-of-a-kind natural sanctuary.